OwnTHD is an audio effect plugin, that makes extra distortion. Distortions can be described as gains in harmonics, which makes up the name of ownTHD – Total Harmonic Distortion. Different amount and styles of distortions would induce different „colors“ on sound, and these colors are originated from real-world vintage equipments. Various classic console simulations, plus unique circuit simulation, to fill in the blank of one feature of your effects: adjust analog feeling. 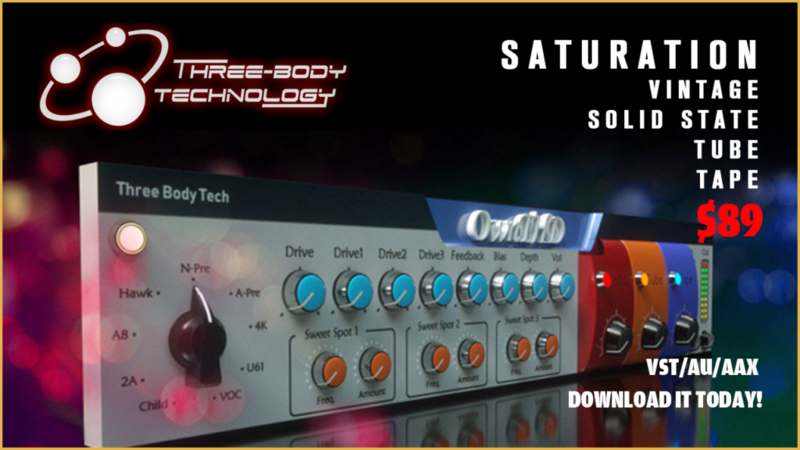 OwnTHD includes four components: Vintage Equipment Simulation, Solid-State Simulation, Tube Simulation and Tape Simulation. All of them are connected in serial, and each can be turned on/off individually. Why do you need OwnTHD? We know you want to make your already awesome track even better. Add compressors and equalizers but still no luck? At old times, we have hardware EQs with two or three fixed-frequency points. Then there comes software EQs that have free and precise control on the frequency. I bet you have more than three EQ plugins (or other mixing effects like compressors). Why do we need more than one effect of the same type? Don’t they do the same job? We know the reason: because different gears have different “color” to the sound. Hold on one second, why bother? Why don’t you buy one effect that has many colors? That’s the reason Three-Body Technology designed OwnTHD. 9 Types of equipment simulation with different “color” to the sound fits different music styles. 4 knobs to control distortion level. you can have more freedom on how to THD. We provide three sweet spot modules, you have the freedom to adjust the frequency and amount of a particular sweet spot. Simulates the characteristics of a solid-state transistor under “ideal condition”. Simulates the effects produced by vacuum tube under “ideal condition”. Simulates the features of a tape machine under “ideal condition”.